A new name was circulating last year: Litracon, a made-up word standing for “LIght TRAnsmitting CONcrete”. The two mentors of this transparent concrete, the Hungarian Áron Losonczi (28) and the German Andreas Bittis (38), had nothing less in mind with their building material than to revolutionize architecture. Thanks to an impressive marketing campaign, the news of a translucent precast concrete block spread around the world like wildfire. Whereas in Germany, the “Spiegel” and the “Süddeutsche Zeitung” gave in-depth reports on this building material, the renowned “Time Magazine” chose this as being one of the most innovative discoveries of the year 2004. Even the “New York Times” devoted a report to this new component. Within a very short time the company had received more than 12 000 inquiries from all over the world for samples. The two company founders are now in dispute over the success of the product. The building material Litracon comprises aggregate-free fine-grain concrete to about 95 percent by volume and optic-glass fibers to about 5 percent by volume. The thickness of the fibers used here can vary depending on the particular requirement. Usually used are fibers of between 0.5 and 1 mm in diameter. The building material is a precast concrete part that cannot be produced from in-situ concrete. The actual final product, the translucent stone is not made using a separate mold but rather is cut to given the required thickness from a large block of material. Only this way can assure that each glass fiber starts at an edge of the stone. Also to be observed is that the concrete body only lets light through in one plane, namely in the direction in which the fibers are lying. By placing fiber fabric, or the alternative method of placing the optic conductors in two dimensions, it should also be possible to realize elements, like e.g. pillars, that would be translucent on four sides. Unfortunately it has not been possible to realize such idea up to now. Neither has the fully transparent cube materialized either: Too much effort is associated still with accurately placing the glass fibers. Production of the material can be compared with making a lasagne. Used as the form is a rectangular mold. This can be up to 2.80 m in length. To be placed in this are layers of glass-fiber mats each covered and interspersed with concrete, the layers of concrete being 2 - 3 mm in thickness. The process has to be executed swiftly and without any major interruptions until the desired overall height for the unit is attained as the homogeneity of the materials cannot otherwise be assured. 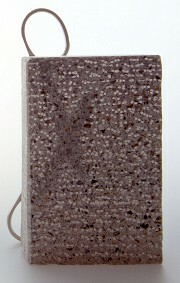 After curing, the concrete block is cut lateral to the direction of the fibers. It is only with this cut through the optical layer that the typical transparency is given. These cuts of artificial stone are the actual final product. Laying the fibers loosely was the method first used in manufacturing. This gave the appearance of an irregular and loose association of layers. Various test runs were carried out, first of all with loosely attached fibers dipped in a bath of concrete and then put through a matrix type of cross-wall put at right angles in the rectangular form as permanent shuttering. The thin bunches of glass fiber strands were routed through the uniform configuration of holes in the cross-wall. This method held the optical strands in place while concrete was being placed. The optical strands are guided in their longitudinal direction over the entire length of the mold and held in place on the outside. Since the concrete composite will be cut up no matter what after curing, it is possible in this phase to simply screen the volume of concrete by the spacers. These grid elements cannot not however be used a second time. Used up to now has been a concrete of the grade C 20/25 (formerly B 25). The addition causes an increase in strength comparable to a C 50/60 (formerly B 55), whereby the strength in the direction of the fibers is significantly higher than the values for the other axes. One cubic meter of the transparent concrete needs about 200,000 meters of optic glass fibers whereby according to Andreas Bittis, one meter of glass fibers costs 10 cents. The high material price together with the large efforts associated with production are the reason why a cubic meter of LiTraCon costs around 50,000.-- Euro. Two construction projects where this building material has been used have been realized up to now. One is in a system of protection against sunshine for a private house in Budapest, the other an official memorial for Hungary’s joining the European Union. This was set up in Komáron, a place in western Hungary with a long history. The monument is located directly where the Wad and the Danube meet. There are also numerous prototypes of the product, like for instance the frequently mentioned “Stockholm Wall”. Such specimens are still being displayed at many fairs where they always attract a big crowd. Áron Lonsonczi, the actual inventor of this building material has since had both process and product protected by international patents. Áron Losonczi studied architecture. He developed his concept for a translucent concrete within the scope of his post-graduate studies in Stockholm 2001. Inspiration for his invention came from two completely unrelated circumstances: In his home town of Czongrad he came across a sculpture in concrete at an exhibition of arts that was cast together with commercially available ESG glass. As soon as the light was incident on the back, the elements of glass began to be so strongly illuminated that these resolved in a very aesthetic manner the otherwise very solid looking concrete body. Somewhat later, the young designer was a visitor to Light Park from the RWE in Essen. This had been styled by André Heller. Fascinating to him here was a room with millions of freely dangling glass fibers thereby forming a full-scale cavern of light. The experience from these two events challenged the engineer to search for a suitable way of realizing such a construction assignment, and he began to experiment. The optical fibers he needed as the material were supplied by the Mainz-based company of Schott. Because of the exceptionally high quantities being ordered by a private customer the company soon became interested in his work and in the fall of 2003, Schott published an article in their company journal about his product called “LiTraCon”. Andreas Bittis had studied architecture as well, and in addition to this was a professional journalist. Having read the Schott article, he contacted Losonczi to arrange an interview. After meeting for the first time, Bittis was so impressed by the product he suggested that he and Losonczi set up a joint company. Both soon agreed on the share of the workload: Bittis wanted to organize the financing needed for marketing and to cover the start-up costs whereas Losonczi shall produce prototypes and drive forward the product development side. The first public presentation of the material in the Ribe Gallery in London triggered an unimagined echo throughout the media. This was followed soon afterwards by another exhibition in Washington DC. Within the space of just a few weeks, the web site www.litracon.com registered more than 12,000 eMails received. Andreas Bittis thought it was easier to count the known architects who had not yet sent a message: Peter Eisenmann, Daniel Liebeskind and Toyo Ito. Renowned journals and daily newspapers started to write about the material and the prototypes were traveling from one professional fair to the next. The prototypes were on show recently at the BAU 2005 in Munich, as well as in Ulm at the Concrete Congress. Yet the hype did not bring money into to the financially distraught company. And then the two partners started to disagree about the type of financing: Bittis favored a start-up in the form of a limited liability company. Both founders should be equal partners. The patent should pass over into company ownership. The participating banks would have been satisfied by just the proper entry in the German Commercial Register as security for financing the company. Yet for Losonczi, giving up the patent he had submitted himself was and is principally unacceptable. In this respect the two appeared to have been at loggerheads for a long time. When it became apparent that Bittis would not be able to provide any money without a patent, the start-up collapsed and Losonzci started to look around for partners with more acceptable financing propositions. The Hungarian inventor favors the licensing model: He wants to retain his patent and to grant licensing rights to a company having the appropriate know-how and the capital, to first of all develop the prototypes further into products and then to market these products. Of course apart from the considerably better financial security for himself, he adds as self-criticism that he as a small manufacturer, does not have either the know-how or the technical possibilities to develop a product to maturity for the market. Nevertheless, he is still wanting the work to develop LiTraCon to continue in his home town in Hungary of Czongrad and to be able to sell the products from his own production. At the present time Losonczi is negotiating with both German and Italian investors. It is still open as to whom Losonczi will sign up with. The young designer is presuming that talks will reach a conclusion by the beginning of April at the latest. To the extent that this is followed by series product development to be expedited, he is anticipating a market launch of at least semi-industrially produced LiTraCon by the fall of this year. He admits the price for translucent concrete means this will never be a mass-production item but he is hoping its use will be a very affordable luxury in the near future. In the meantime however, the opaque building material can be procured in small quantities directly from Áron Losonzci.